They needed a win. They should’ve won, but somehow the Colorado Avalanche found a way to lose 4-1 to the visiting Florida Panthers, a team that until last night had only won four games. Not only did the Avs lose at home to one of the worst teams in hockey, they also have lost center Matt Duchene with an oblique injury. There is no concrete news as of yet, but Duchene injured his oblique in the third period of Saturday night’s game. The bad news is oblique injuries are hard for hockey players to come back from. The oblique is an important muscle … for everyone, but especially sports players. With a strain, Duchene’s return will be sooner than later. If he tore it, he may not be back this season and he can forget about making the Canadian Olympic team. It is troubling to see the Avs starting to stumble and fall into old habits: losing to bad teams. With a loss of Duchene, I worry more about this clubs prospects for the season as number nine is a very important player and leads the team in goals (12) and game winners (3). This is going to be a big blow to the team. 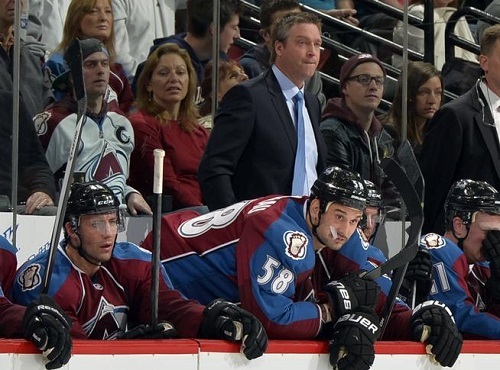 Colorado Avalanche coach Patrick Roy looks on during the second period of Saturday night’s game against the Florida Panthers. Sorry, Cap, but being committed and getting results are different things and your team potentially just lost its best player to a nagging injury and you guys lost a sloppy game to the Panthers.